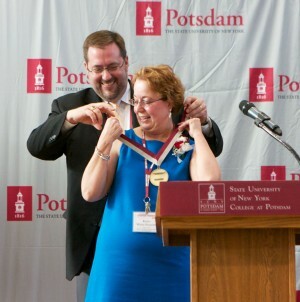 Kathy (White) Finnerty was recently honored by the SUNY Potsdam School of Education Alumni Association with the 2012 St. Lawrence Academy Medal at the college’s annual reunion weekend. Kathy White Finnerty, SUNY Potsdam class of 1975, was awarded the St. Lawrence Academy Medal for her significant contributions to the field of professional education or related fields by the Alumni Association at their recent reunion weekend. Finnerty was presented the award for her significant contributions to the field of education. For the past 33 years, Finnerty has served Oswego County BOCES in a variety of roles. As curriculum specialist at OCB’s Burton Ramer Technical Career Center, she is highly regarded as one of New York State’s premiere authorities on career and technical education. She is responsible for coordinating the CTE approval process including curriculum development and review, national certification designation and implementation of state and national assessments. She co-authored the New York State Education Department publication Criteria for Evaluating Instructional Textbooks in Occupational Education, was part of the development team that wrote NYS’ curriculum for occupationally related math, and developed an innovative software program to reinforce content and reading skills in career and technical areas. Finnerty has been invited to speak at state and national conferences in her field and was one of 48 national winners of the MIND Award, presented by the National Association of Vocational Education Special Needs Personnel for her outstanding contributions to special needs students enrolled in vocational programs. In addition to her duties as curriculum specialist at OCB, Finnerty is also co-advisor for the National Technical Honor Society and is very involved in the High Schools That Work Initiative including her work as an evaluator/rater for the HSTW assessment in the areas of reading and writing. She also contributes significantly to the implementation of the Vocational and Technical Education Act grant. Working for a Board of Cooperative Educational Services, Finnerty believes, affords an individual so many more opportunities for growth and involvement in many initiatives. “Through my work at Oswego County BOCES I have been exposed to unique kinds of experiences and opportunities. The administration has always encouraged me to participate and work on the state and national level,” she said. A feeling of mutual respect is obvious with Finnerty calling Camp “a visionary” who can take the ideas she brings back from collaborations with other BOCES and schools across the country and implement them into programs here at OCB. “This vision has given us a leg-up in CTE,” said Finnerty. Finnerty lives in Central Square with her husband, Patrick, and daughter, Alexis.